I don’t know about you, but I’ve been having a problem with my vision lately. Well – for the past several years, really. (It’s the age thing). I find that I’m wanting better and brighter lighting, especially as I work on fine details of machine appliqué. The more detailed a quilt piece is, the more light it seems that I need. The one I’m currently working on has the appliqué on a black background, which makes it just a little more challenging as far as light and lighting is concerned. I’m working on a new sample for my upcoming class at the BERNINA Creative Center in April – My Grandmother’s Heart. The sample is filled with beautiful roses, hearts and birds and lots and lots of machine appliqué stitching to be done. As I was stitching away today, I found that I was getting frustrated with the glasses I’m wearing – I just can’t see as well in them, and I really need to have an eye exam – but no time for it. 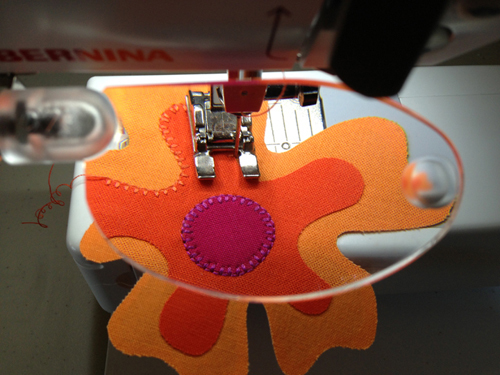 Do I need more light, one placed on the sewing table behind my machine so I can see more clearly where my edge is? On a black background, stitching done away from the appliqué is the kiss-of-death. Colors on a black background “pop” as if it were neon like no other background will. So, any stitching that doesn’t hug the edge of the appliqué is a pretty noticeable sign of poor workmanship – something I definitely don’t want to be seen on my sample. One of my students had the magnifying glass on her BERNINA during class and told me about its virtues with machine appliqué. I stashed it in my suitcase, unpacked it when I returned home, and promptly forgot that I had it. Well, the figurative light bulb turned on over my head, as I realized that this little, very important, notion for my BERNINA is really what I need, not more light. I screwed the magnifying glass onto the little hook at the front of my machine and stitched. Crisp, clear appliqué edges that allow me to stitch exactly where I need to, to create beautiful, precise fine machine appliqué. The Magnifying Glass attachment just made my work so much easier to create! One of the many reasons why I love BERNINA!! Does the 780 have the attachment hole for the magnifying glass? How about the 170 ? Thank you. Does the magnifier fit on the smaller machines, like the B 330? ptakers you can purchase the Magnifying-lens set, but you may also need the accompanying mounting bracket. 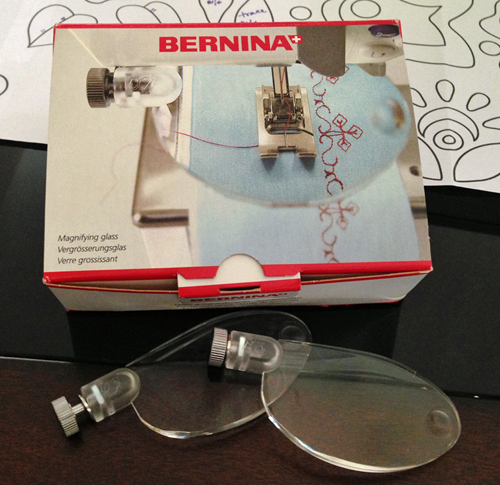 Please check in with your BERNINA store for personal help with purchasing the set for your B 330.